1974 was a very special year for the young 25 year-old Steve Garvey. After splitting time with Bill Buckner at first base with the Dodgers in 1973, he claimed the job full time in Spring training of 1974. 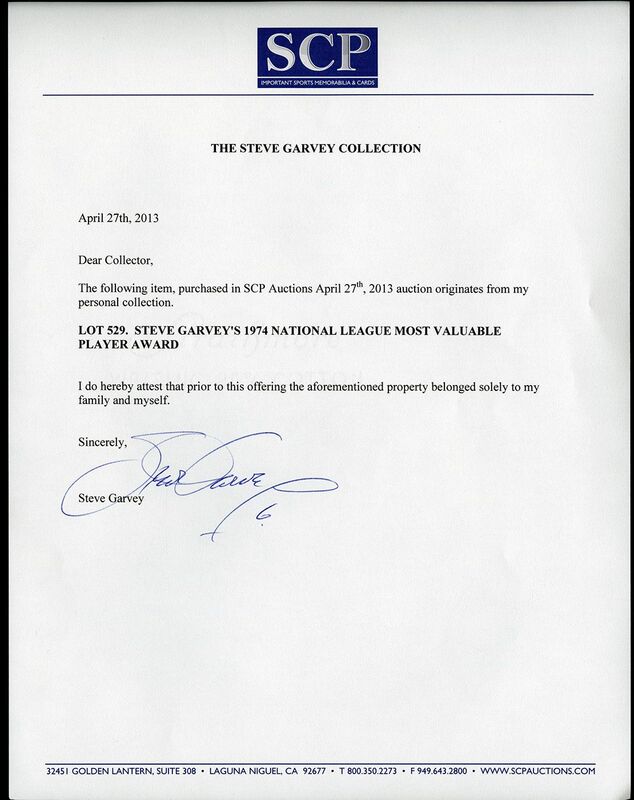 Playing in 156 games, Garvey had a .312 batting average with 200 hits, 21 home runs, and 111 RBI. This would be the first of six 200 hit and the five 100 RBI seasons. Voted as the NL All-Star teams starting first baseman as a write-in candidate by the fans, he responded with a 2 for 4 performance in a 7-2 National League victory and claimed the All-Star Game Most Valuable Player Trophy. He would finish off the magical year batting .389 with 2 home runs and 5 RBI in the National League Championship Series against the Pittsburgh Pirates and hit .381 in a losing effort versus the three-time World Champion Oakland Athletics. 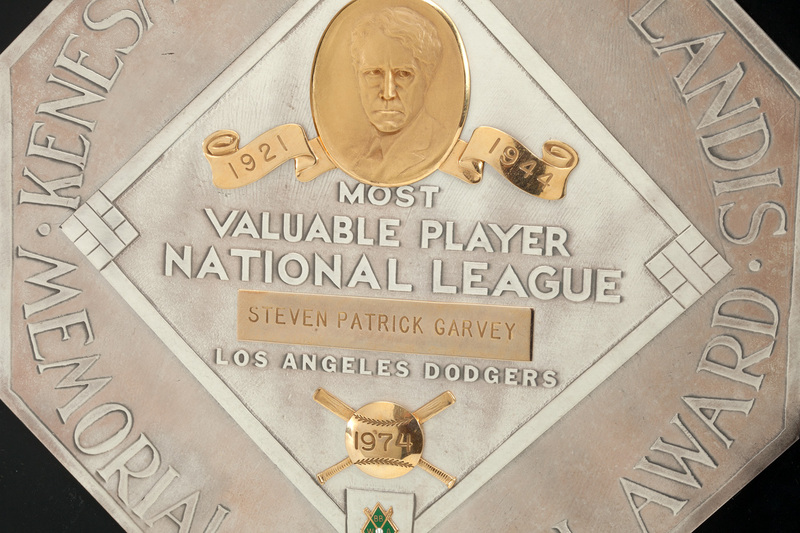 For all his accomplishments during the 1974 season, Steve Garvey was named the 1974 National League Most Valuable Player by the Baseball Writers Association of America. Offered here is Garvey’s 1974 NL MVP Award plaque. The elegant circular trophy is comprised of a 16” diameter black wooden backing affixed with a metal octagonal plaque and 10k gold accoutrements. Green felt on back bears a Dieges & Clust trademark at center. 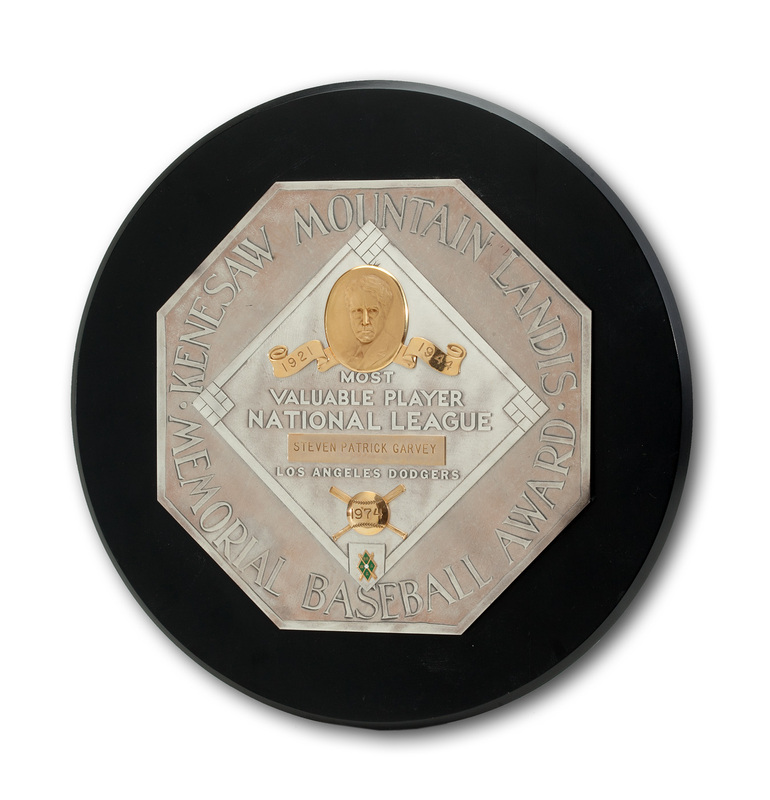 A rare and significant offering of Baseball’s most prestigious individual award, given to one of the most popular and dynamic players ever to have put on the Dodger uniform.